“The commitment from DCC’s top management to this project is really what has made it successful,” he said. Hallak said that the client – Dubai-based developer Abdulsalam Al Rafi Group – has also kept a watchful eye on the project. DCC took on the project in September 2010 when its basement and six upper floors had already been completed by a previous contractor, Belhasa. 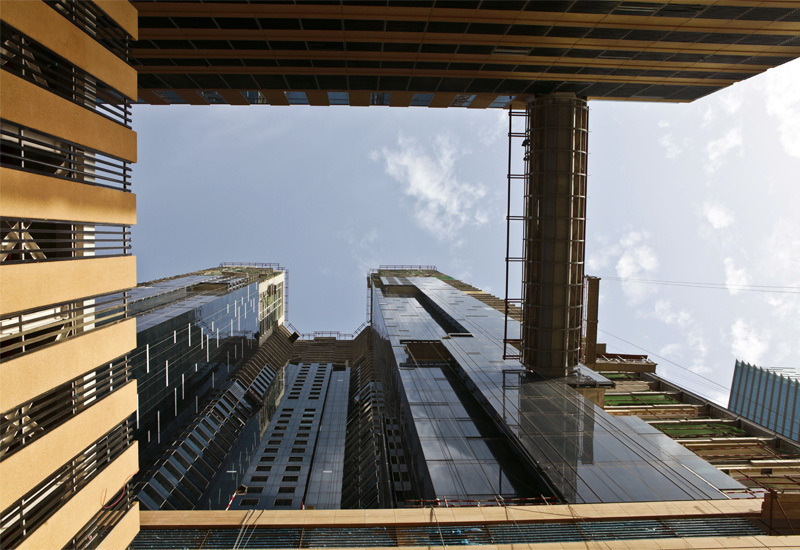 DCC certainly has experience of delivering similar projects – the next group of buildings along Sheikh Zayed Road such as Sama Tower, the Fairmont Hotel, Conrad Hotel and the Chelsea Tower have all been built by DCC, while on the opposite side of the road it has built the World Trade Centre Residences, Capricorn Tower, Rolex Tower and the Bright Start building, among others. Hallak said that the resources committed meant the superstructure was completed ahead of schedule. The surface area of a floor in each tower is around 4,500m2, and at its peak DCC was completing between four and four and-a-half post-tensioned slabs per month using formwork and scaffolding from Doka. “If you passed through Sheikh Zayed Road you would see that building really jumping. “At that time, we had around 1,200 people – with our engineers, foreman and all the site team. “When we started it was not that fast. But since these were typical floors, people would really get used to doing that work. The feat was more impressive considering the site’s restrictive location. Given that it fronts Sheikh Zayed Road at its intersection with World Trade Centre roundabout access was an issue. Deliveries were only allowed during evenings and trucks were only granted access to Sheikh Zayed Road between 11pm and 6am – in line with RTA rules. As a result, concrete pours usually began at around 6pm and would continue through to 2-3am. The amount of concrete required for the building – 218,000m3 – also meant that two separate suppliers were required. As a result, the superstructure works were complete on January 31, 2012 – some five months ahead of the scheduled completion date of June 4, 2012. The project’s logistical challenges have remained, though. The tight site has meant that materials generally cannot be stored on site and have had to be brought in as and when required, which has meant close negotiation with suppliers. Some materials have also been held offsite in DCC stores. Three tower cranes and three external double-hoists were also being used as well as DCC’s own mobile cranes, but demand for access was such that each of the subcontractors was allocated a time slot for use of the hoists each day. The site’s six lifts also needed to be commissioned as early as possible, so that the external hoists could be removed in order for cladding to be fitted. There are now around 2,000 people on site as the project nears its anticipated completion in August this year, with schedules altered slightly to accommodate improvements to the hotel’s design – a five-star Sheraton by Starwood Hotels Group is set to open on site next year. Among the major subcontractors are ETA Star for the MEP works and Alico for the external cladding. However, Hallak explains that for elements of the fit-out such as tiling, painting and plaster works, the firm has had to package works and split them between several different contractors. “We had to go to more than one contractor, sometimes reaching three or four subcontractors. Hallak said that this hands-on management of the project will continue past the involvement of subcontractors, with its own specialist snagging team set to put the finishing touches to the project. “A subcontractor cannot do what we are asking them to do,” he said. “Our team will go in with paint, silicone and timber and do that part to reach the high standards we advised – or we promised – the client that we would deliver. “This is something that other contractors maybe lack but we as DCC are committed to it. Maybe some people think this is small, but we as DCC take pride in doing this because when you go inside a room and you see small, small things you think that this has been done neatly. This entry was posted by admin on March 11, 2013 at 5:24 am, and is filed under News. Follow any responses to this post through RSS 2.0.You can leave a response or trackback from your own site.